Typical accelerated life testing analysis involves using failure data at different stress levels (e.g., different temperatures or loads) in order to build a life-stress relationship and generate a failure distribution at use conditions. The question that often arises is what fixed stress value should be used to represent the use conditions. Using a mean or median stress could result in an overly optimistic calculated reliability or life. On the other hand, using a worst case stress could yield an overly conservative estimate, making it challenging to meet the product’s reliability requirements. This article presents a method to estimate reliability at use conditions by using accelerated life test data analysis and considering a use stress distribution instead of a fixed use stress. Assume that we have performed an accelerated life test on ball bearings. A total of 65 bearings were tested at loads of 3,500, 3,800 and 4,500 pounds. The test duration was 20,000 hours, at which point all non-failed bearings were suspended. Field load measurements have shown that the use load distribution is lognormal with log-mean = 7.6 and log-std = 0.4. Our goal is to estimate the reliability at 30,000 hours of normal operation. 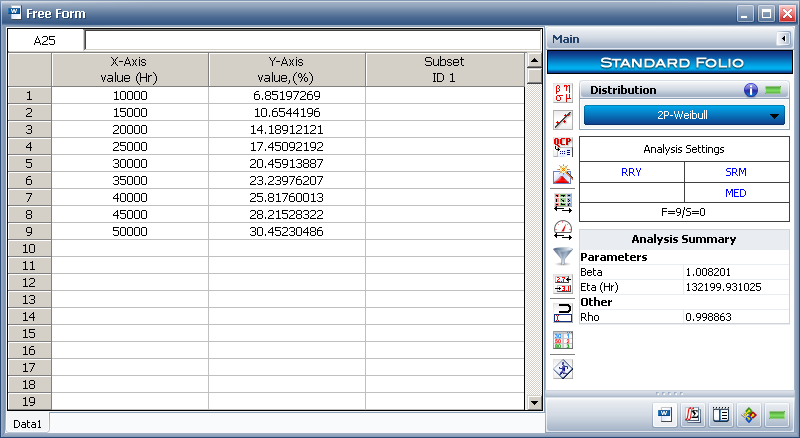 The following figure shows the test data as entered in ALTA along with the calculated model parameters. Note that an inverse power law life-stress relationship was used due to the mechanical stress, along with the Weibull life distribution. In order to calculate the reliability at 30,000 hours in ALTA, we have to enter a use load value. If this is assumed to be the median value of the use load distribution, which is approximately 2,000 pounds, the calculated reliability will be 95.1%, as shown in the next figure. If we want to be more conservative and instead of considering the median load we consider the 90th percentile load (3,336 pounds) as the use stress, then the calculated reliability will be 21.39%, as shown next. When we use the median as the use load, the calculated reliability is fairly high, which could be too optimistic; however, when we use a 90th percentile use load, the calculated reliability is very low, which could be too conservative. Ideally, we would want to use the actual field load distribution when calculating reliability in order to avoid having to decide which use stress to select. This can be achieved using the stress-strength comparison tool that is available in Weibull++ and ALTA. 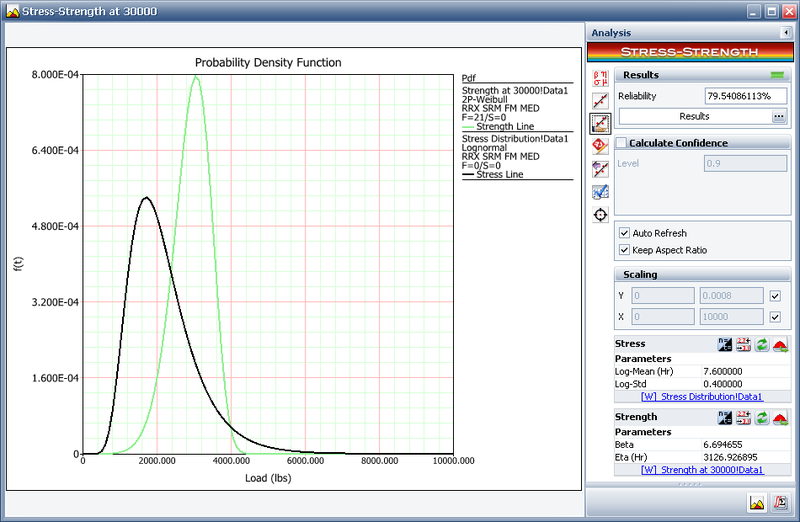 The stress-strength analysis involves overlaying a stress distribution, in this case the field load distribution, and a strength distribution in order to calculate reliability (i.e., the probability that strength will be higher than stress). Given that we already know the stress distribution, our task is to determine the strength distribution using our accelerated test data. 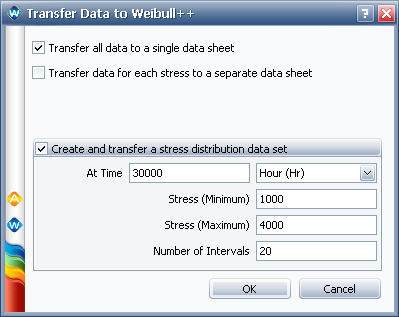 We can automatically generate the data needed to estimate the strength distribution in ALTA by clicking the Transfer Data to Weibull++ icon in the control panel ( ) and selecting the Create and transfer a stress distribution data set check box, as shown in the next figure. The time selected is the time at which we want to calculate reliability (30,000 hours in this case). The minimum and maximum stresses represent a range of possible field loads (1,000 to 4,000 lbs. in this case). 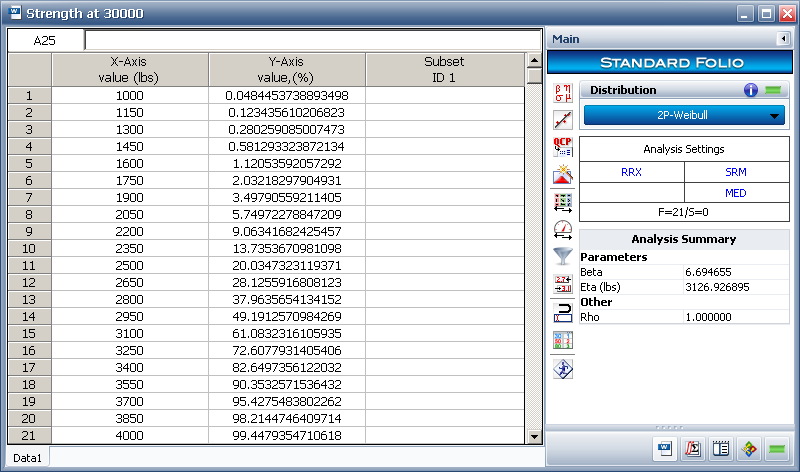 Finally, by selecting 20 intervals we will generate 21 data points. 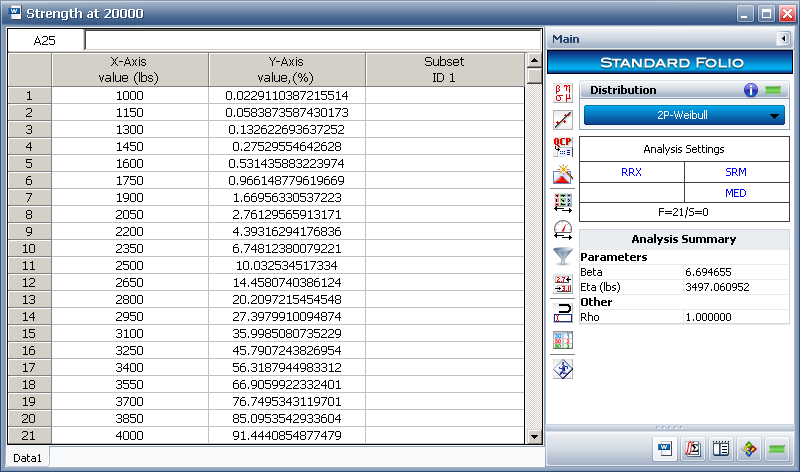 These data points are exported to a free-form data sheet in a new Weibull++ folio, as shown next. 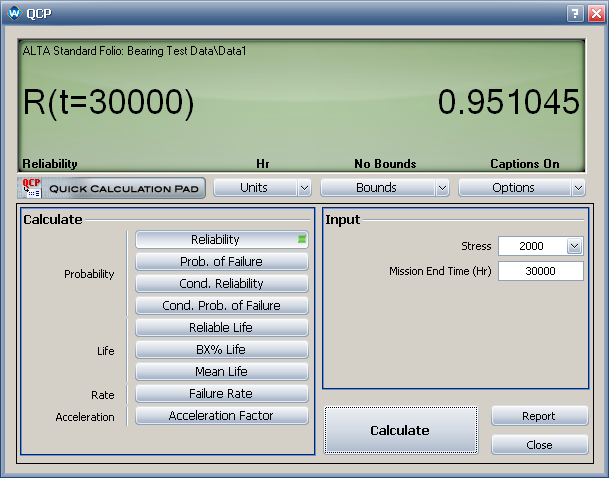 In this data sheet, the X-Axis values represent different loads while the Y-Axis values represent the corresponding probability of failure at 30,000 hours. The 2P-Weibull distribution that is fitted to the data can estimate the probability that a bearing will withstand a given load at 30,000 hours; in other words, it represents the strength distribution of our bearings at 30,000 hours. 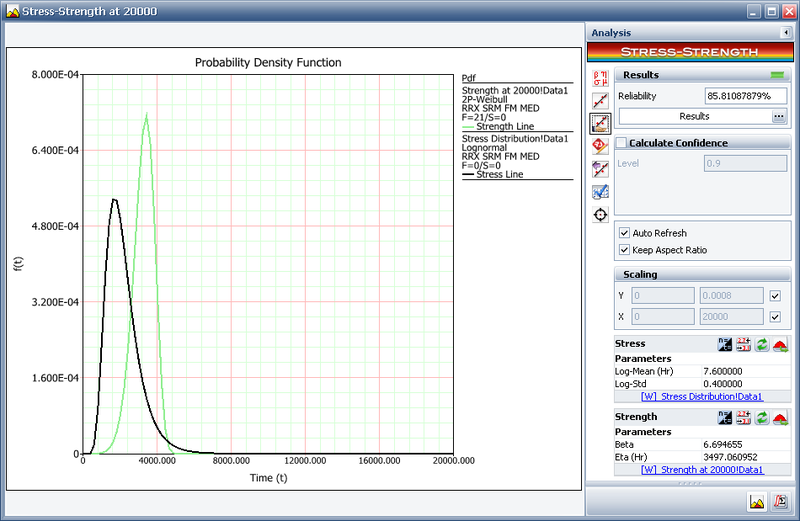 Now, we can use the stress and strength distributions in the stress-strength tool, as shown in the next figure. Using the accelerated test data and the use load distribution, the reliability of our bearings at 30,000 hours is found to be 79.54%. This value is more conservative than the one found using the median load but not as conservative as the one found using the 90th percentile load. If we want to calculate reliability at any other time, we need to follow the same process, exporting the strength distribution data from ALTA using the time of interest. 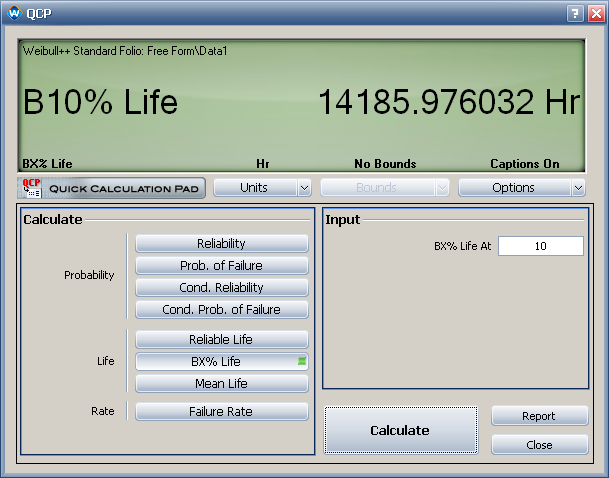 If we want to calculate a life metric, such as a B10 life, we will need to find the time that will produce a reliability of 90%. Since this could possibly require multiple attempts, another workaround would be to fit a distribution to the calculated reliability values at different times. For example, if we follow the same process as before and now export the strength distribution data from ALTA at 20,000 hours, we will have the following free-form data sheet. Using the same stress distribution, the stress-strength tool will calculate a reliability of 85.81% at 20,000 hours as seen in the following figure. If we follow the same process for other time values as well, we can generate a free-form data set such as the one shown next. In this case, the X-Axis values represent different times while the Y-Axis values represent the unreliability that was calculated at those times using the stress-strength tool. By fitting a distribution to this data set, we can calculate any reliability metric of interest. 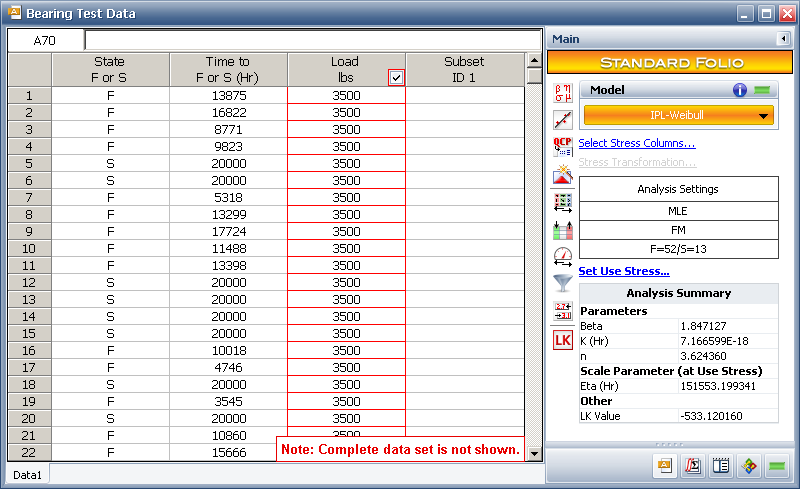 For example, the B10 life of our bearings given the assumed use load distribution is 14,186 hours, as shown next. In this article we discussed how we can calculate reliability using accelerated life test data and considering a use stress distribution. The process involved generating a strength distribution from the ALTA model and using the stress-strength tool to calculate reliability. We then used calculated reliability values at different times in order to create a failure distribution that can produce any reliability-related metric. Using this method, we do not have to assume a fixed use stress value as in typical ALTA modeling but can take into account a distribution of use stresses.